It’s been a while now since LG announced it’s planning on coming up with it’s own payment system, LG Pay. 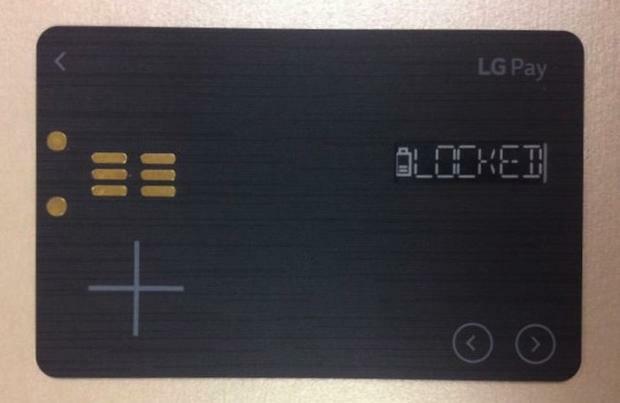 A recently leaked photo suggests that LG is going to distinguish its new service from all the other smart payment solutions out there ( Apple Pay, Google Pay, Samsung Pay etc.) by not needing a smartphone at any point of the process. It looks like LG wants a hassle-free solution for its customers. That would explain why LG may have manufactured a universal smart card that would simultaneously store multiple of the user’s credit cards and would work with just a swipe. It would be marketed in South Korea first and would reportedly be called the ‘White Card’. There may not be a big launch as LG plans to make only 50,000 of these in the early stages of development. The leaked photo reveals a few features of the card. It looks and weights almost the same as a regular credit card. It has two navigating arrows to switch between cards, one low-key LCD display, a re-programmable magnetic strip, a battery icon and a charger connector. How long the battery would provide power after a full charging session is still in question. It would certainly be annoying to find your card out of power while shopping at a retailer’s. The White Card is reported to support various schemes of digital payment solutions – credit cards, debit cards, reward cards and loyalty cards and more. It would be able to withdraw money from the ATM as well. However, the idea of a universal credit card didn’t come to LG before anyone else in the business. Startups, Coin and Plastc, had been trying to market their own smart cards but didn’t have much luck with that. Coin’s one even came with 2 years battery back up without having to recharge. How the White Card will pan out or whether it will give the existing tools a good competition – questions like this will have to wait until its official launching at the MWC. Would YOU want to replace your credit cards with a White Card? Share with us in the comments section! OPPO Promises Breakthrough Technology for MWC!